Norwegian Cruise Line are pulling out all the stops for the launch of their latest ship, by introducing a celebrity chef to the fleet along with a Broadway show. Celebrity chefs, and their signature ocean-going venues, have become increasingly popular in recent years — with cruise lines such as P&O Cruises boasting the like of Marco Pierre White and Atul Kochhar. NCL have decided to get in on the act with Geoffrey Zakarian introducing three fish restaurants onboard the soon to arrive, Norwegian Breakaway. Ocean Blue by Geoffrey Zakarian, will be the chef's flagship and the most upmarket of his offerings — NCL described Ocean Blue as a "luxury seafood dining experience". The Raw Bar, which is adjacent to Ocean Blue, will offer ocean fare paired with wines by the glass, for a more relaxed feel, with Ocean Blue on the Waterfront the final venue that will offer a casual venue with alfresco dining. 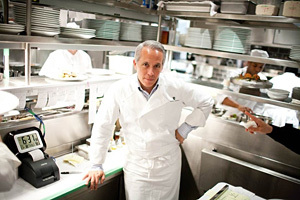 Geoffrey Zakarian, in case you were wondering, is a celebrity chef in the U.S. He has appeared in a variety of TV shows in the U.S. including an appearance as a judge in the Food Network's Chopped. Zakarian's cuisine is often described as modern French, so that Mediterranean influence should come in handy. NCL are also bringing Broadway's Rock of Ages to the Breakaway, following the success of Epic's Blue Man Group and Royal Caribbean's adaption of Chicago: The Musical among others. The Tony-Award-nominated musical will headline Norwegian Cruise Line's flagship while she sails from New York. Kevin Sheehan, Norwegian's president and CEO said: "As a lifelong New Yorker, it's critically important to me that Norwegian Breakaway becomes New York's ship. Our goal is to bring elements of New York on board so that guests will feel a real connection to the ship as New York's true flagship." Norwegian Cruise Line are definitely turning up the heat onboard and are making huge strides forward in an attempt to take on the likes of Royal Caribbean and Carnival. The Norwegian Breakaway is looking set to be a fantastic ship offering great food and entertainment and will no doubt ruffle a few feathers on her arrival.